Menu to be served from 11am to 2 pm! For dinner reservations, click here! UPDATE: SOLD OUT. Pop Up Brunch this Saturday at The Old Firehouse Wine & Cocktail Bar, Downtown Duncan. 11am - 2pm. Enjoy an evening of incredible local cuisine perfectly paired with the terroir driven wines of Emandare and Unsworth to capture an amazing sense of place on your plate and in your glass. We will start the evening mingling with one of Jeff’s masterpiece cocktails, then transition into a five course meal prepared by chef Ian Blom and served with select wines as both winemakers Mike Nierychlo and Dan Wright share with you the journey from grape to glass. Also, this is the space to enter any special information, such as allergies, etc, in case we can make accommodations for you! Valentine's Day! We are offering a 3 course meal, all details below. When reserving, feel free to mention any requests or dietary restrictions and we will be sure to accommodate them and be in touch with you! New Year's Eve is coming soon to The Old Firehouse ~ and we are now officially open for dinner reservations! 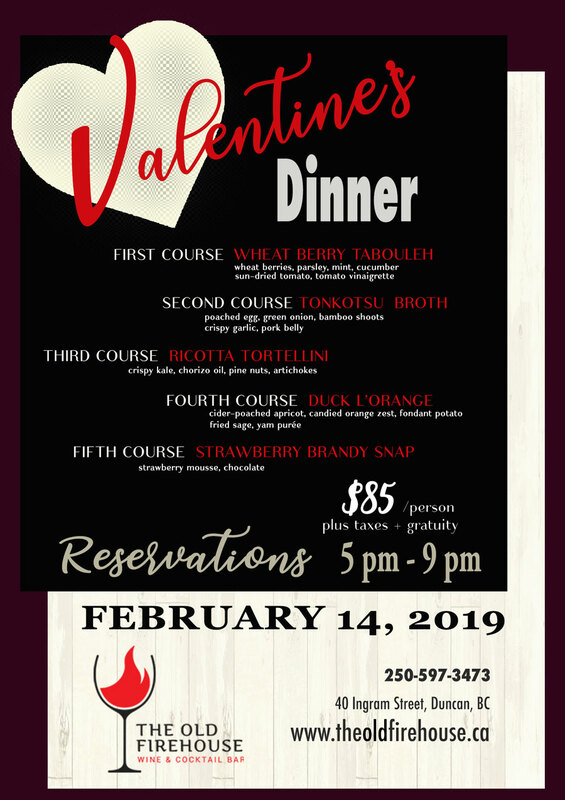 Call us at 250-597-3473 or click here to reserve online (scroll to bottom of page). We are offering a 4 course menu, plus an amuse-bouche to tempt your taste buds early. Tickets are $65/person + tax, with optional drink pairings for each course available. Dinner seatings will start at 5:30 pm, with final reservation time at 8:30 pm. Join us for the Cowichan Wild Wings Dinner Benefit for the Somenos Marsh Wildlife Society! There will be some Marsh Trivia, Prizes, and much to learn about the marsh, and the ways our community can help! Roasted Cowichan Squash and Local Chanterelles with Quince and Ginger Puree, Crispy Sage and Brioche Crumb. From Mike and Robin of Emandare Vineyards: "We are partnering up with the Old Firehouse Wine Bar as part of their Winemaker’s Dinner Series for an amazing 5 course evening of incredibly crafted dishes by chef Ian Blom paired with all five of our wines. Join Robin and I as we share more of our story with you while we all enjoy a beautiful meal together." Click post title for complete details and to see the evening's menu.